The United Nations food agency and Libya today collaborated in a joint programme that seeks to increase food production while protecting the country’s natural resources. Both parties signed the agreement to projects include a number of strategic projects aimed at supporting the new Libya in responding to its development goals and priorities. Under the agreement, Libya will provide $71 million in funding needed to develop different areas particularly in areas such as plant and animal health and production, pesticide management, seed development, natural resource management, capacity building and institutional strengthening. The Director-General of the Food and Agriculture Organization (FAO) Graziano da Silva said the projects will also aim to preserve natural resources such as water, and will benefit farmers, herders and fishers as well as their organizations and cooperatives and traders. FAO notes that the projects will significantly enhance the capacity of the Ministry of Agriculture, Animal Wealth and Marine Resources to implement all the proposed activities under the agreement. Ministry staff will receive both short- and long-term technical training as well. UN World Food Programme (WFP) said that the disruption of port activities, coupled with the lack of fuel and hard currency, is making it difficult for the country to import enough food. There are some 2.5 million third-country nationals in Libya, some 500,000 of whom have already left the country amid the fighting that erupted earlier last year between Government forces and rebels seeking the ouster of Colonel Muammar Qadhafi. On February this year, today the citizens of Libya marked its first anniversary of the country’s uprising against Muammar Gaddafi with spontaneous celebrations nationwide. Citizens in all ages went out on the streets of Tripoli, Benghazi, Misrata and other towns to begin the celebrations by setting off firecrackers and chanting slogans. The celebrations were led by residents of Benghazi, the city which first rose against Gaddafi and his 42-year-old regime. Muammar Gaddafi was killed at his home town of Sirte on October 2011 when he was overrun by fighters seeking to complete the eight-month uprising. 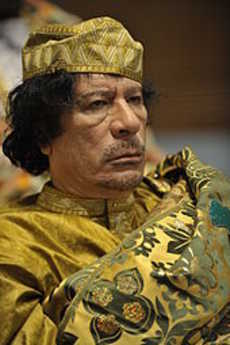 Gaddafi’s demise marks the end of a 42 year rule of a dysfunctional brutal regime that was ruled by fear, torture and executions. Its mismanagement of the economy brought ruin to Libya and impoverished the Libyan people despite the huge oil and gas wealth.